« JAMA paper finds some adolescents experiment with stuff – so what? Tasmanian smokers to be offered choice: quit or die! Tasmania consults on better protections for cigarettes and new ways to promote cancer… Okay, that’s not quite how they put it. But they have been consulting on further turns of the prohibitionist screw on e-cigarettes. I have collaborated with the excellent folk at the New Nicotine Alliance UK (NNA) to respond to the consultation – our attempt at solidarity across the hemispheres with benighted vapers and the potential vapers denied choices for no reason. Consultation information: Consultation page / Discussion paper. Australia and its states and territories have often set trends in tobacco policy and what happens in Australia often has global significance. In the case of e-cigarettes and the wider concept of tobacco harm reduction (the availability of low risk alternatives to smoking for those who cannot or do not wish to quit using nicotine), Australia is setting a terrible and misguided example. It has adopted illiberal prohibitionist policies that protect the cigarette trade, deny smokers better and safer products, and will ultimately cause more misery, disease and death. E-cigarettes present an opportunity far greater than any conceivable threat. But I think the problem starts far upstream in Tasmania and Australia for that matter. How do they think about what they are doing – the ethics, the approach to risk, the case for state intervention etc. So rather than repeat the whole 12 page submission let just repeat the section that tries to grab the attention on how these prohibitionists see the world. 3. Do you have any other comments? 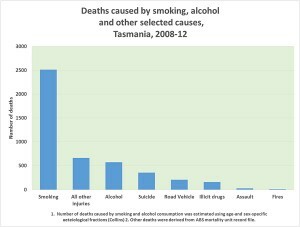 How can we justify preventing Tasmanian smokers having access to e-cigarettes as a much safer alternative to smoking, while we allow cigarettes to be widely available? How many extra people might we cause to continue smoke who might otherwise quit smoking through e-cigarettes, and what responsibility would we bear for any premature deaths that occurred as a result? We may not know everything about e-cigarettes, but given what we do know, what judgements should we make and how do we validate these or adjust our policy as knowledge evolves? Because we don’t have complete knowledge of e-cigarettes, are we right to ensure that consumer choice is limited to only the products we are certain are highly dangerous? How likely is it that someone will take up vaping who would not otherwise have smoked, what harm would it cause and how would we weight this against the very significant health benefits to smokers who switch (or potential smokers who never start)? Unintended consequences. Finally, the analysis systematically ignores highly plausible unintended consequences that could arise from regulatory choice made in Tasmania and Australia generally. For the most part, these would have the effect of making e-cigarettes less effective and appealing as alternatives to smoking – and in doing so risk increasing smoking and protecting the cigarette trade. Tasmania has hitched itself to the prohibitionist idea of a Tobacco Free Generation – supported by its tobacco control group, Smoke Free Tasmania. This means anyone born in or after the year 2000 cannot be sold cigarettes, no matter how old they get. I guess in 2050 you could be carded on your 50th birthday under this scheme. As it is one of tobacco control’s ‘endgame’ ideas, I have criticised this proposal here as part of a wider critique of prohibitionism in tobacco policy. I say with due modesty, my version of the endgame for smoking-related death and disease is better and far more plausible – through the interplay of consumers and markets the emergence of technology and innovation will render death-dealing smoking products obsolete without having to ban them or punish the users. That is unless authorities like Tasmania actively obstruct the obsolescence of cigarettes, restrict consumer choice to only the most dangerous products, and apply abusive force of law to suppress the market demand that is driven by smokers wanting to look out for their own health. That’s it Ive had enough of this Government BS I’m going to propose what Ive been planning to for a long time now and see what happens if they turn me back then High Court it is these Useful Idiots continue to take the absolute piss time and time again. There’s Always an excuse or a “new” Propaganda report or media release for them to point too, They couldn’t even do a real Trial that warranted anything significant as suggested “The Trial Will Demonstrate the effective and efficient Out come of ecigs” more like it was a collection of old news and a paper exercise. Its like your continuously dealing with Kids that have never worked in the Real world. No wonder there’s an Ice epidemic and suicide rates are up. They always find someone or something else to blame or complain about. If its not Employment rates,Coal mines or helicopter Flights its the Greens Charging Ecigs in House What a Goose. First WA then QLD now NSW.. Lets See the worms come out of the woodwork over the next few weeks. Those making the decisions and Those that have made decisions are about to get a wake up call. Having Jumped Through Hoops for as long as I have before Launching Subi Vapor Only to be greeted with what continues to be negligence has finally come to and end. In the leadup to Cancer Council Australia’s biggest annual fundraiser, here’s a cheeky parody pointing out that the organisation is effectively selling Cancer Credits to Big Tobacco Retail. The government of NSW is pragmatic-Liberal ,and popular . Its proposed legislation on ecigs was only that there be no sales to minors, no other restrictions. However the government unfortunately does not, quite, have the numbers in the upper house and therefore a strange alliance of the authoritarian left -Labor, and authoritarian right wing christians, added amendments to the bill that were close to a effective ban on ecigs. The bill has been ‘referred to committee’ and it could sit there for some time. Assuming that the NSW government does not follow the prohibitionist path there could be constitutional issues if a state tried to restrict-ban trade , in ecigs, from NSW to Tasmania , not sure(am no constitutional lawyer) but it could be interesting. It is beyond me why the recreational use of a drug as innocuous as smokeless nicotine, by consenting adults , is even remotely thought to be a matter for law makers at all. (baring the usual ‘food purity’ considerations). John, this issue is about control, and money, (specifically tobacco taxes in this case), and how best to keep the money flowing, while appearing to be concerned for “health”. The prohibitionist schemes appeal to those people who like to feel morally superior to smokers, (or anyone else they consider below themselves), and have a desire to punish those same “sinners”, because they can. If they can make a dollar from them as well, all the better. This is nothing to do with the illusion of right/left political divisions, both are authoritarian in nature in Australia, the current government adds fascism to it guiding principles, but it is simply a tool to gain greater control of the people and their money. It has never been about health, which is why it is so hard for those who actually do care about the health of smokers, or anyone else, to understand, unless they engage in twisted logic and cognitive dissonance. I also find it hard to understand why those in power seem to want control of every single aspect of our lives, even down to how we decide we want to quit smoking. I cannot accept that this is because they “care”, I know from my own experience that caring has nothing to do with this takeover of our personal lives and health. I have grown cynical, (or as I see it, I’ve stopped being fooled by the lies), and do not believe that there is any intention on the part of politicians to take into account the views of vapers, smokers, or anyone else they consider beneath them. That however, does not mean we should just give up, but I wont be holding my much increased breath, waiting for any change in the policies of prohibition and punishment, which are what our current laws are when it comes to smokers and vapers. While I do not disagree , my perspective is that there is a lot of institutionalized stupidity in the mix, and institutionalized stupidity is really hard to change; Its solution to ‘problems’ is to force the world to look like ‘it’. Oh dear, Clive, yet another government taken in by the lobbyists against e-cigs. What can I say? It gets so tiresome to read about, when it seems such a no-brainer that e-cigs should be encouraged rather than banned. But you are doing a great job, as always, in tirelessly trying to put forward the voice of reason on behalf of vapers everywhere. Thank you for your hard work, your persistence and your good sense. Thank you. Thank you. Thank you.